5-6 October 2016, Rome, Italy. 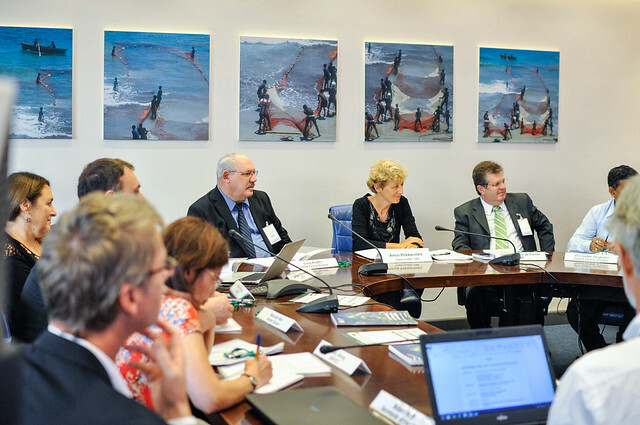 FAO's Global Forest Resources Assessments (FRA) Advisory Group met in Rome and discussed ways to streamline reporting processes. More meeting photos by clicking on the image. FAO implements the Global Forest Resources Assessment (FRA) on request of its member countries. To implement this mandate, FAO regularly seeks broad guidance from a large number of national and international experts and agencies. The FRA Advisory Group was established in 2002 on the basis of a recommendation from an Expert Consultation held in Kotka, Finland. It is informal in nature, but it is acknowledged and endorsed by the statutory bodies of FAO such as the Committee on Forestry (COFO). It is a long-term arrangement with meetings anticipated to take place annually. Specifically, the Advisory Group is tasked to review activities and outputs and make recommendations in order to strengthen existing institutional networks, to make future forest resources assessments increasingly user-oriented and demand-driven, and more closely linked with other international processes. Advise FAO and its partners on the implementation impacts of the broad recommendations of the expert consultations on forest resource assessments. Advise on how FRA can support SFM. Advise on the strategic planning, organization, process and time frame of FRAs. Advise on technical matters related with forest inventory or assessment including variables for FRA. Advise on the scope, content and reporting format for FRA. Advise on communication processes and meetings between stakeholders in the FRA process, including regional arrangements, expert consultations and links with other international forest-related processes including those related to criteria and indicators for sustainable forest management. Advise on the role and terms of reference of the national correspondents to FRA. Any other FRA related task approved by the AG. a. The FAO Advisory Group on Global Forest Resources Assessments (hereafter termed AG) will be an informal body and will generally be constituted of not more than 20 members. Any member country of FAO, if it so desires, can send its representative to work as an observer to the AG. b. The AG can invite experts to provide technical advice during its meetings or can invite professionals to attend its meeting as observers. c.	The AG will normally meet once a year. However, it can be called, as and when required. d.	The term for AG members will be two years, renewable upon agreement of AG member and the AG Secretary. e.	The AG can also function through email group discussions, if and when required. f.	In the event an AG member retires or changes jobs the member should notify FAO so that arrangements for continuation or replacement can be made. g.	The AG will have a Secretary to manage, document and process its operations with FAO providing necessary secretariat support. The Senior Forestry Officer, Global Forest Resources Assessment, FAO will function as the Secretary to the FRA AG. S/he will be responsible for drafting and the final version of the minutes for each of its meetings. h.	The AG will have a Chairperson and a Co-chair that will serve for a five-year period to coincide with the preparation and delivery of the FRA. The Chair and Co-Chair will be selected from nominations submitted by AG members and FAO to the AG Secretary. The Chair and Co-Chair will be selected from the list of nominations provided in advance of the first AG meeting in each FRA cycle. The selected Chair and Co-Chair will serve terms that end with the last AG meeting coinciding with or prior to the release of the FRA. i. The Chair and Co-chair will jointly manage AG meetings and will approve the minutes of each AG meeting. j. The draft minutes of the meeting will be prepared by the Secretary and distributed to the members of the AG for comments. Based on comments received, the Secretary will finalise the minutes and submit these to the Chairperson/Co-Chairperson for approval before distribution. k.	The Secretary to the Advisory Group will work with the FRA team, CFRQ partners and other members of the FAO Forestry Department in action plans incorporating AG recommendations. Other members of the AG may also submit the proceeding to the respective reviewing bodies in their organization through their normal channels of communication. l.	The AG may make changes to its OM as and when required.